Fayette County 911 Director Bernard “Buster” Brown, at left, at the March 22 meeting of the Fayette County Commission was joined by Carbyne911 U.S. Chief Operating Officer Eyal Elyashiv. Photo/Ben Nelms. The Fayette County Commission on March 22 approved $192,000 for an advanced 911 platform that will integrate with the current 911 system. A first in the U.S., the Carbyne911 technology will result in the availability of dispatchers to receive video and texts from the caller while pinpointing the caller’s location. 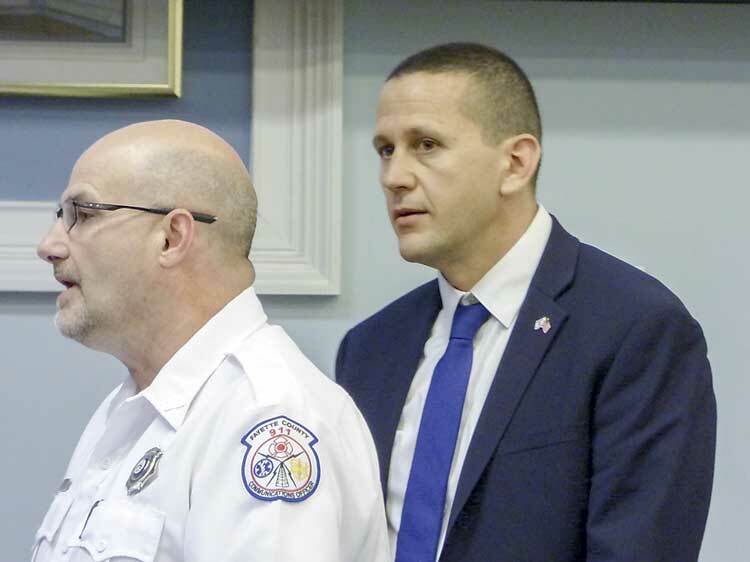 Above, Fayette County 911 Director Bernard “Buster” Brown, at left, at the March 22 meeting of the Fayette County Commission was joined by Carbyne911 U.S. Chief Operating Officer Eyal Elyashiv. Photo/Ben Nelms. County 911 Director Bernard “Buster” Brown said the Carbyne Advanced NG911 technology will turn the current E-911 into (Next Generation) NG911. County staff recommended, and commissioners approved, a $192,000 expenditure that would make Fayette the first 911 system in the nation to utilize the Carbyne IP-based emergency communication platform to integrate into the existing public safety infrastructure. Because Fayette is the first to implement the Carbyne technology, the price was cut by 50 percent to $192,000 for the first year and by 33 percent, again at $192,000 for succeeding years. The system features real-time smart phone video using the caller’s phone, exact indoor and outdoor location accuracy including at elevation, call prioritization, shorter call duration, text-to-911 and notification of family or friends if the caller desires. The new system will work in two ways. One is by notifying callers to 911 that the system can be accessed immediately while on the phone with a dispatcher or by the caller downloading the Carbyne app. Essentially, the caller to 911 will have to give permission for information, including the phone’s camera, to be accessed by 911 dispatchers. “The caller decides if he wants to use the technology or not, and when the calls ends the caller is off the system,” said Carbyne911 U.S. Chief Operating Officer Eyal Elyashiv. Citing privacy concerns, commissioners prior to the unanimous vote wanted to ensure the no information received by the system would be sold or released to a third-party. Elyashiv confirmed that no information would be released. “This information is the sole property of Fayette County,” Director Brown said. Elyashiv said data will be stored in the cloud used by the U.S. government. “This technology is being deployed globally, and privacy is the No. 1 issue,” sid Elyashiv, noting that the Carbyne911 platform is being used in areas of Europe and Asia. A number of public education efforts will be rolled-out in the coming weeks prior to the system going live this summer. Information will also be available on the 911 center’s Facebook page at Fayette County (GA) 911. Fayette was the first in North America to pilot the Carbyne system, from August through December 2017. Director Brown said Carbyne is currently being tested in Coweta County and is being evaluated by a number of metro Atlanta counties. 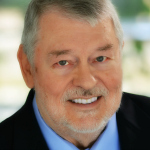 Asked how Fayette came to be the first 911 system in the country to conduct a beta-test, Brown said that, as a past president of the National Emergency Number Association (NENA), he learned about Carbyne from a colleague who served on the NENA board who had visited Europe and saw the product. Carbyne911 has offices in New York and Tel Aviv.